As I explained on Friday, Brandon and I are each posting our picks for the world’s 10 best national flags. I didn’t see Brandon’s post before writing mine, but here’s his ranking, based on design. Does the white symbolise peace? No! It symbolises phosphate, which gave the tiny island what little economic prosperity it’s had. Although it’s now an entity unto itself, the Union Jack is actually a composite of three pre-existing flags, each of which was the cross of a nation’s patron saint. The blue background with white saltire (diagonal cross) comes from St. Andrew, patron saint of Scotland. The red perpendicular cross is St. George’s, the patron saint of England. And finally, the red saltire is the cross of St. Patrick, the patron saint of Ireland. The ability to incorporate the national flags of three nations is impressive. But two things prevent the Union Jack from ranking higher: First, it doesn’t incorporate Wales or the cross of St. David. Second, because it’s so ubiquitous in the upper left-hand corner of other countries’ flags, the Union Jack has lost its uniqueness (this is a friendly way of saying that the flag has become synonymous with colonialism). What’s great about the Star Spangled Banner is that it’s basically just a template. Even though the US has grown from 13 to 50 states, the flag hasn’t had to be significantly re-designed. If Puerto Rico ends up voting for statehood this November, it won’t be a problem for the flag; we have a system in place. The 13 stripes representing the original 13 colonies stay in place, while a new star gets added for each new state. And hey, if we ever lose a few states here or there, that’s no problem for the flag either! The sense of continuity of the flag is important for a country that has constantly expanded geographically throughout its history. After all, if the flag had changed much, we would have to change our national anthem (“The Star Spangled Banner”) as well! I’m not sure how the presence of six colours will comport with Brandon’s design sensibilities, but they’re all necessary for South Africa. The country redesigned its flag in 1994 after the end of apartheid to represent the new attitude of this rainbow nation. Green, black and yellow are the colours of the African National Congress, which fought to end apartheid. Red, white and blue are the colours of the flags of both the Netherlands and the UK, from whence the majority of white South African’s ancestors came. And although it may just look like a melange of colour, there is some potent symbolism to the flag: the sideways ‘Y’ represents convergence. Most countries that are the product of European conquest and resettlement completely sweep their pre-European history under the rug when they portraying themselves through their flag (I’m looking at you US, Canada, Australia, New Zealand, and most of Latin America). But Mexico puts an important Aztec symbol right in the centre of its flag. The eagle holding a snake , perched on top of a cactus, which in turn is on top of an island was a symbol to the Aztecs to build Tenochtitlan (now Mexico City) on an island in Lake Texcoco. So I give props to Mexico for owning and acknowledging their aboriginal history. But the flag is prevented from ranking any higher because it turns out it was a bad idea to build a city there. In just the past 100 years, Mongolia has had a theocracy, a people’s republic, and now, ostensibly, a parliamentary republic. But all of those disparate forms of government have featured the soyonbo on their flag — so important is its place in Mongol consciousness. The soyonbo, in case you hadn’t already figured it out, is that stack of symbols over on the left side of the flag (the “hoist” in vexilloligical lingo). It represents a whole lot of things in a very stylish way. See if you can find all of these symbols in the soyonbo: Fire, earth, moon, the mutual complement of men and women, the walls of a fort, a spear or arrow, honesty, justice and equality. The symbolism of colours is a mixed bag: the blue represents the endless sky — rather unimaginative. But the red represents the Mongolian people’s ability to survive in harsh conditions. I’m not sure how the colour red portrays that, but props to the Mongols for toughing it out in the Gobi all these years. That thing that looks like a stylised tulip is in fact a symmetric form of the word “Allah” in Arabic, and also contains overlapping parts of the Shahada, one of the five pillars of Islam. Additionally, the script along the border between the green and white stripes, and the white and red stripes (which looks like fancy lacework) is the phrase “Allahu Akbar” or “God is great,” repeated 22 times. Not bad for a flag you didn’t think had any writing on it, huh? Lots of countries glibly toss “stars” on to their flag to represent all sorts of things. So you might not find anything remarkable about the 27 stars on Brazil’s flag representing its 27 states. But this is not mere symbolism and these are not just homogenous starlike emblems, arranged into rows or columns. NO, my friend each one depicts an actual star in the heavens, and the astronomical precision of it all is extraordinary. The positioning of the stars on the flag mirrors how they would have looked to an observer in Rio de Janeiro at 8:30 am on 15 November 1889 (the day the Republic of Brazil was proclaimed). There are no fewer than 9 constellations depicted on the flag. That’s already remarkable specificity, but it gets better! Each star represents a specific state in Brazil, based on 1. The size of the state and the brightness of the star, and 2. The location of the star in the sky (as seen from Rio) and the location of the state within the country. So, for example, Alpha Virginus, the only star that appears above the band with the motto of “Order and Progress” represents Para, the northermost state in Brazil at the time of the Republic’s founding. Oh, also the green and yellow represent the colours of the former Emperor and Empress of Brazil, but who really cares what anything else on this flag represents. They could have JUST the blue sphere with its stars on a completely white background and they would make my list. European flags tend to be pretty disappointing: Hundreds, if not thousands of years of recorded history that have generated countless national symbols, defining historical moments and heraldic emblems, and the best that most of them can come up with is three different-coloured stripes? Thankfully, Croatia gives us a sampling of its rich and varied history with its flag. The checkerboard has been part of Croatia’s coat of arms at least since the country’s nobles aligned themselves with the Holy Roman Empire.The five shields atop the checkerboard each represent a historical kingdom within modern Croatia. The one on the farthest left (the six pointed star above a crescent moon) is the oldest known Croatian coat of arms. The five historical kingdoms represented by the shields are, in order: Croatia, Ragusa, Dalmatia, Istria, and Slavonia. Now that the sun has set on the British Empire, there are quite a few sovereign countries which count themselves former British colonies. The struggle for independence was usually a defining moment in many of these countries’ respective histories, but the only reference of it on the flag is usually just the colour red, to symbolise the blood shed in that struggle. And then there’s Barbados. When Barbados became independent in 1966, the new government organised an open competition to design the new flag — so this flag already has a good meta-history to it. The man whose design won the contest — one Grantley Prescod — went for a very complexly layered, but very powerful symbol. That trident on the flag represents several things, sure, including the three principles of democratic government: Of, by and for the people. But it also makes reference to Barbados’ colonial badge, which pictured Britannia wielding a trident. The trident on the new flag has no handle (It is commonly referred to as “the broken trident”), symbolising that no one else, Britain or otherwise, could ever wield power over Barbados. That, my friends, is how you create a national symbol. Brandon needs to re think his designs Mongolia and Nahru are incerdible! Who cares about soccer shirtts !!! Thanks David, after reading this, and also Brandon’s, I have a much higher appreciation for Brazil’s flag. Incredible! Good research… or at least I hope you had to do some research for this post, but if you didn’t, I give you even more props for knowing all that you do. @David: Matching on 3 out 10 isn’t bad. Fears of Czechoslovakia averted! And I almost included Iran in my honorable mention but I bumped them last minute. @Susan: Mongolia isn’t bad, I don’t care for Nauru. It’s a bit too literal on the design front. But it works for symbolism. Also soccer jerseys are important as they represent a country just as well as the flag. Croatia’s jerseys would make my top 5 national shirts. IMO, and what I’ve read about vexillological principles, Nauru is great, Mexico’s eagle is too detailed and cluttered as is Croatia’s. Brazil is wonderful except the lettering- nothing would be lost by losing the lettering and it would bump up the simplicity and elegance quite a bit. Iran… *sigh*.… yes, it’s a nicely designed flag but no Iranian I’ve known well is Muslim. (I doubt that’s just a selection bias.). Wales isn’t represented in the Union Jack because Wales was already incorporated under the English flag when the Union Jack was designed. No mention of the asymmetrical design of St. Patrick’s cross? Coats-of-arms on Croatia’s flag is wrong in vexillology. 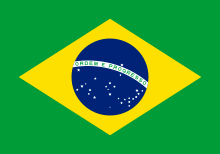 Text on Brazil’s flag is wrong in vexillology. The stars on American Flags are too small. Better to have one star representing 5 states. Also the red and white bands for the 13 original states should be reduced to represent only the 6 or 7 ? states of the North as they are the ones who fought for democracy, equality and justice. That way, the bands would be larger and the flag would look better from a distance. Mexico? Again, the coats-of-arms on a flag is wrong. I love Nauru! # 1 in your list.